The FTSE 100 Futures is trading at 6,913.50 with a loss of -0.48% percent or -33.50 point. The CAC 40 Futures is trading at 4,966.00 with a loss of -1.25% percent or -63.00 point The DAX Futures is trading at 11,217.50 with a loss of -0.25% percent or -28.00 point. The EURO Stoxx 50 Futures trading at 3,122.00 with a loss of -1.08% percent or -34.00 point. the FTSE 100 was down 0.92% to 6,939.55, while the pound was edging higher by 0.19% against the dollar to 1.28372 and flat versus the euro at 1.1272. 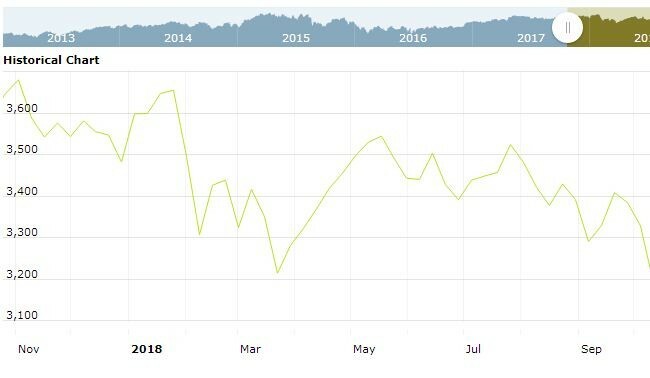 For the week, the top flight index shed 1.6% to 6,939.56, alongside a drop of 1.5% in cable to 1.28268 as a result of the build-up in political uncertainty amid the UK’s withdrawal from the European Union. For the day the FTSE 100 closed at 6,939.56 with a loss of -0.92% percent or -64.54 point. France’s CAC 40 closed at 4,967.37 with a loss of -1.29% percent or -64.92 point. Germany’s DAX closed at 11,200.62 with a loss of -0.94% percent or -106.50 point. For the day the Dow is trading at 24,688.31 with a loss of -1.19% percent or -296.24 point. The S&P 500 is trading at 2,658.69 with a loss of -1.73% percent or -46.88 point. The Nasdaq Composite is trading at 7,167.21 with a loss of -2.06% percent or -151.12 point. In other parts of world, Japan’s Nikkei 225 is trading at 21,149.80 with a loss of -0.16% percent or -34.80 point. Hong Kong’s Hang Seng is trading at 24,717.68 up with +0.00020% percent or +0.049 point. China’s Shanghai Composite is trading at 2,544.10 with a loss of -2.11% percent or -54.75 point. India’s BSE Sensex is trading at 33,613.07 up with +0.79% percent or +263.76 point at 12:15 PM.